Dawn Of The Dead remake director Zack Snyder took the Frank Miller graphic novel about the battle of Thermopylae and turned it into a sweeping cinematic triumph, depending heavily on CGI. 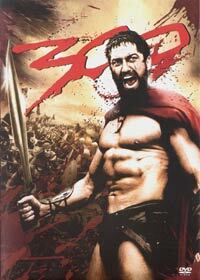 As with Robert Rodriguez’ highly effective adaptation of Miller’s Sin City, 300 has a very similar feel. With its golden and sepia tones, the digital landscapes, surroundings (and often characters) do not feel artificial as it pulls the viewer into this historic fantasy world where a god-king (Xerxes) is out to rule by submission. But he meets his match in king Leonidas of Sparta who refuses to kneel before him. However, the laws of the land forbids him to take up arms, so he devises a plan to meet the massive Persian army with only 300 of his best warriors. And what a clash it is! Brutal action, fantastic slow motion sequences, passion, hatred, bravery, madness. While very testosterone driven, this is not merely a man-flick, but a total blast. The double DVD release includes a look at the origins of the story (including historians), the mission to get the studio hooked, the making of the movie, director’s commentary, interviews with Snyder, graphic novel creator Frank Miller and other key players, as well as various webisodes covering aspects of the production from set design and creature FX, to the gruelling training and costumes. A movie based on a graphic novel which is based on historic accounts of 300 Spartan warriors facing a Persian army of 1 000 000 men / elephants / ogres / and other beasts. For starters there is a little politics, a little dash of romance, and spiced up with some treachery. This gets drowned out by the main course of violent and bloody battle scenes filled with corpses, decapitations and a lot of blood. The main course outweighs the other stuff by far and there's hardly a dull moment once it is served. I will be back for a second serving without doubt because TONIGHT WE DINE IN HELL ! Popcorn and a slush with extra BLOOD. Excellent.